El Chalten is an upcoming (if not already) hot spot for tourism and on the edge to become a mainstream place-to-be in Patagonia. Nevertheless, not yet a McDonald’s restaurant can be found there so I can still recommend to pay a visit to this lovely spot close to El Calafate. The “Rio de las Vueltas” is already a known place to packrafters from around the globe and you can find more information about rafting trips on this river here, here and here. 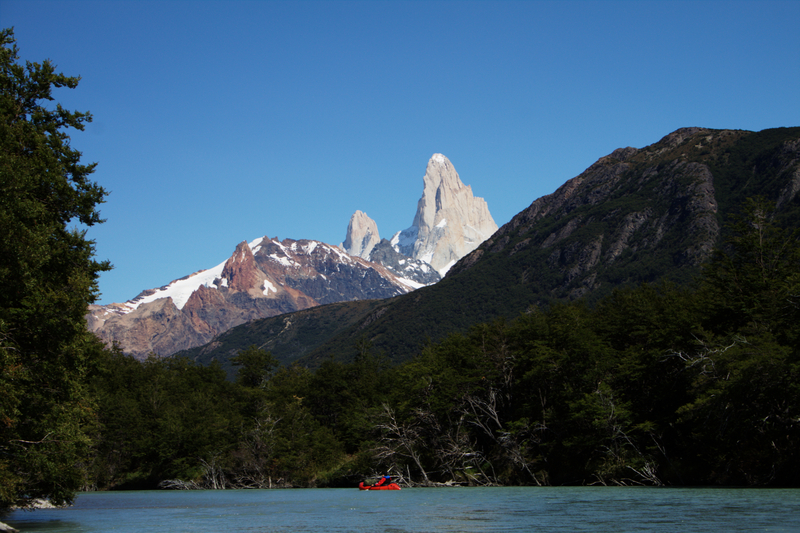 It’s a nice river without big challenges (as of FEB 2015) but with awesome views on the Cerro Torre and easy to be accessed. Caution: This trip contains a border crossing that is not possible / allowed according to local Chile Border Police. Therefore, please do review the situation with authorities from Argentina and Chile before you follow instructions below. It is clearly NOT recommended to follow our path again without previous engagements with authorities – more information below. 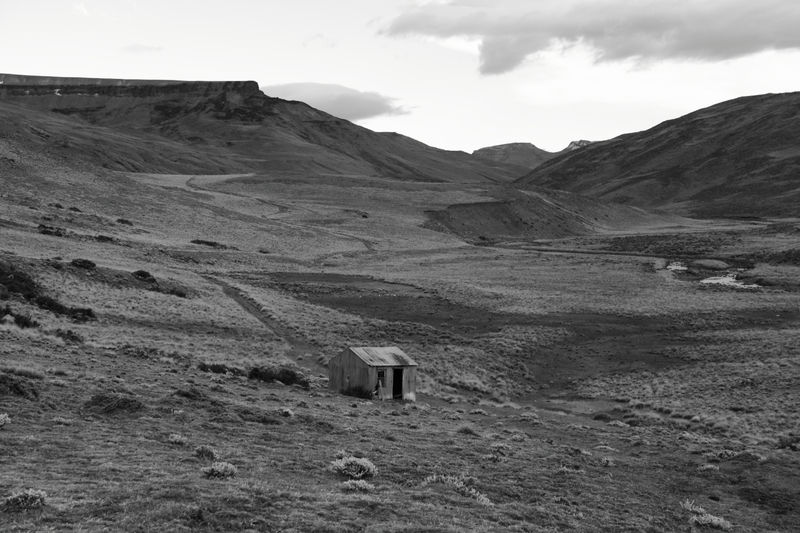 There is no official place to resupply until you reach the Laguna del Desierto which has a kiosk. So you need to carry all your food form the very first beginning on (unless you want to ask/pay locals). For the traverse: We didn’t follow any official trail (is there any?) 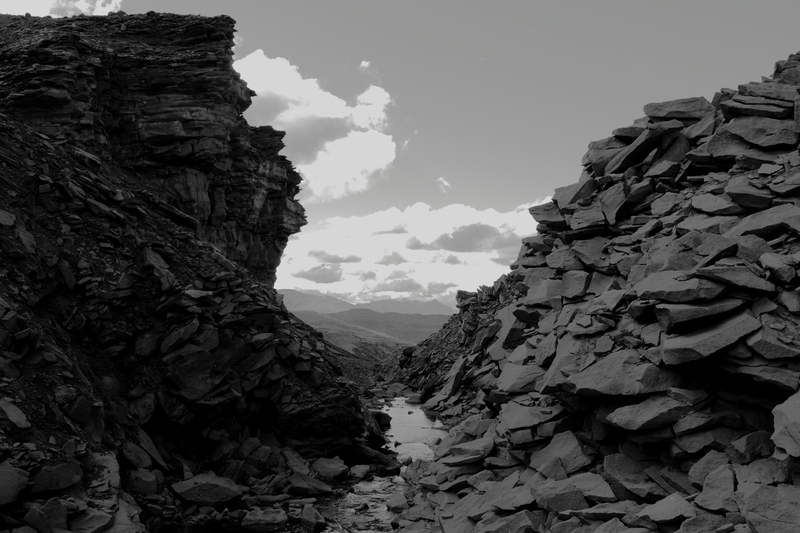 Hence, you need to prepare the right trail based on GMaps or BingMaps – the area up there is quite lonely but not too difficult to cross. It took as around 2 days to cross it. Caution: The border crossing we did from Argentina to Chile caused us a lot of issues at the Chilenean border police in Lago Ohiggins (-48.86929, -72.74208). We basically got stuck there for 1 day since Chile did not accept the exit stamp from Argentina border police. I strongly do NOT recommend to cross the border (-48.89705, -72.69654) via the path we took without previous engagements with both Argentina and Chile border police although locals could tell you otherwise. The estancia also rents horses. The border crossing trail requires to cross one river and also takes some time since it’s not a well maintained trail. We also lost the way several times in the swampy area around here -48.91854, -72.63549. 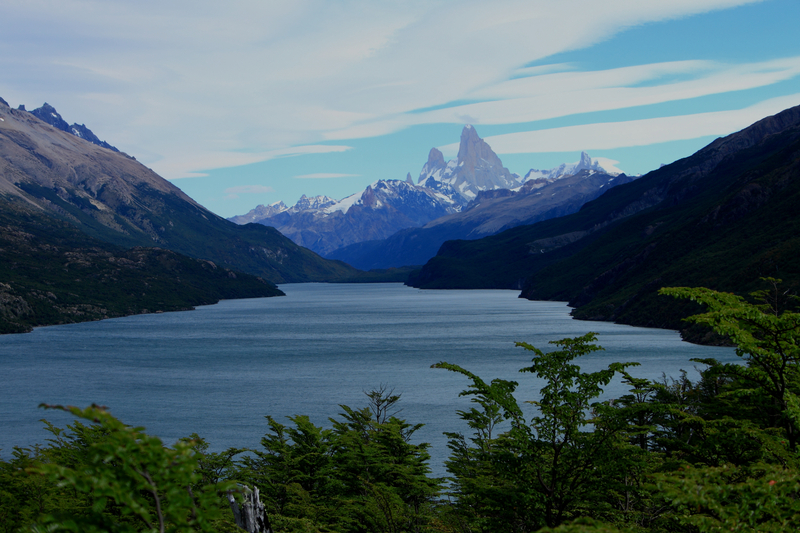 Once finishing all formalities with the Chile border police in Lago Ohiggins, you can head south towards Laguna del Desierto. 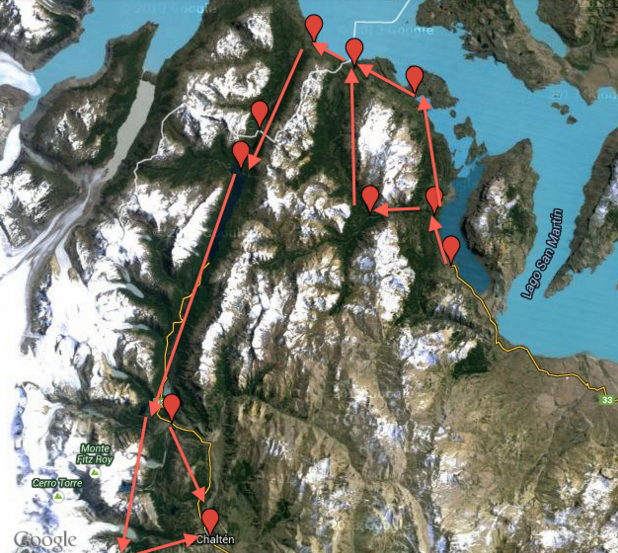 You can also extend the trip by heading north-west and then south-west to Lago Chico.There is plenty of material on the web for these kind of extensions. 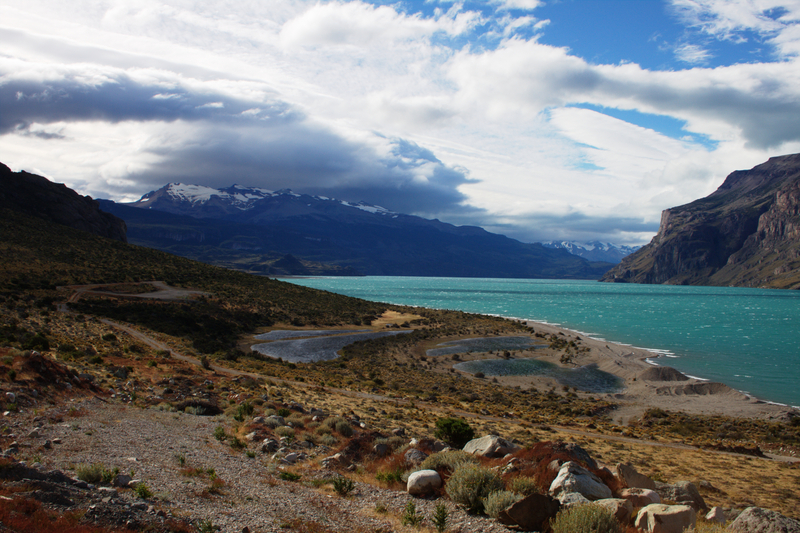 You can also take the boat and head up north to Villa O’higgins in Chile. We inflated our packrafts near this place for convenience purposes: -49.10253, -72.90485. Be aware that there are some waterfalls upstream that you cannot raft according to our information. 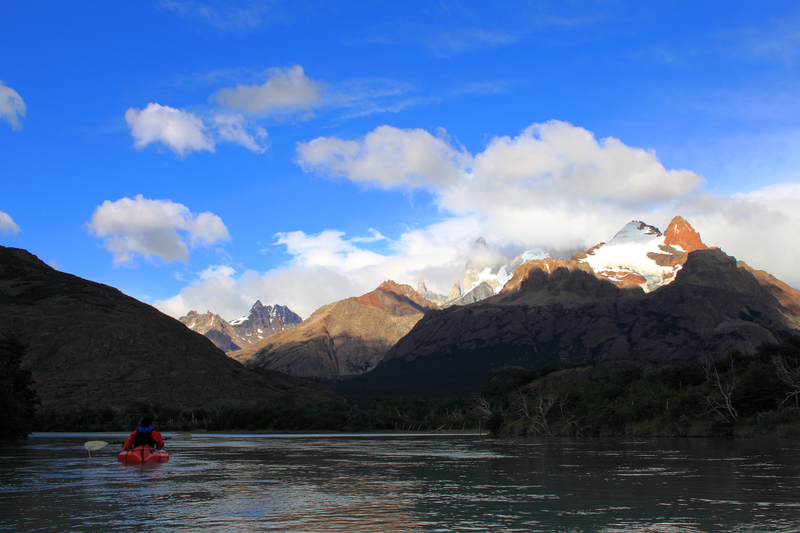 From there, you can easily float down to El Chalten in 2 days or even less depending on the speed of the river. 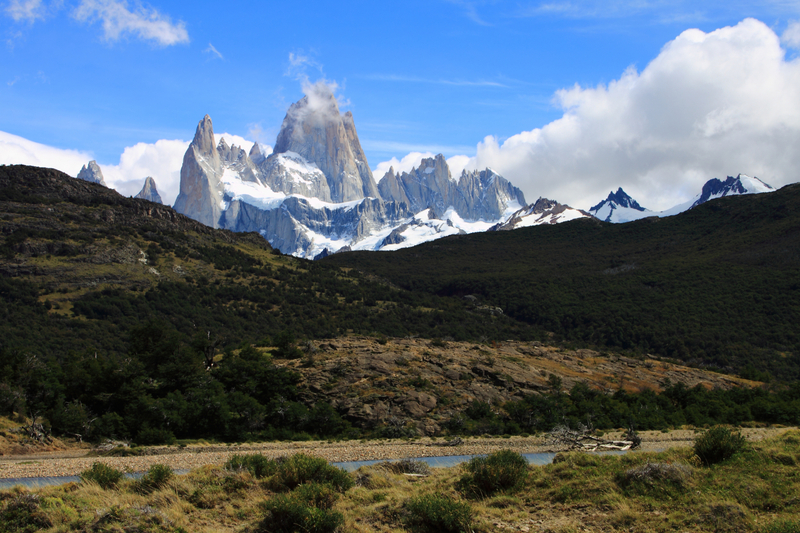 Be aware of the famous patagonian winds! Yes – they are strong and will have an impact on any packrafting attempts. On the Rio de las Vueltas, take care of potential barb wire in the river or on the shores which could harm you and your packraft. Consider the red-marked recommendations above in regards to the border crossing – you can get into trouble easily otherwise. The walk upstream is recommended nevertheless – nice views! 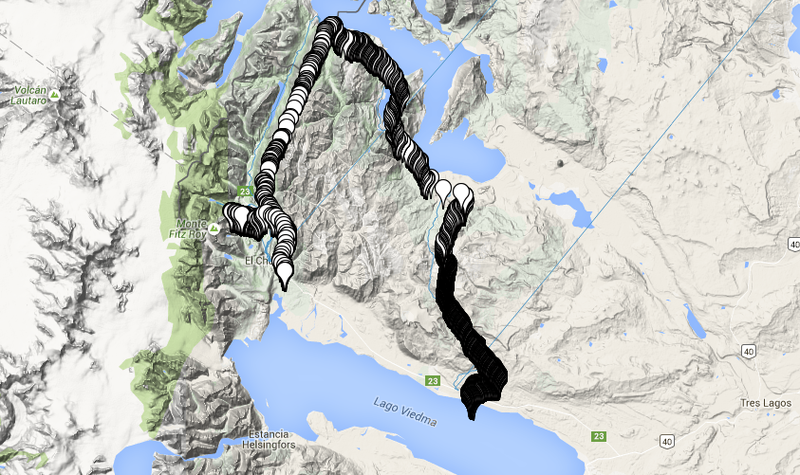 If you bring your packraft, you could do the extra round to this peninsula: -49.03741, -72.48744. You can get back on the gravel road with packrafting this area here: -48.99103, -72.52555 until you reach the gravel road again. There is a trail on the peninsula that you can use and cannot miss. Take care of strong winds!